Wanted To Buy-Large original Matchless Star lamp bases. 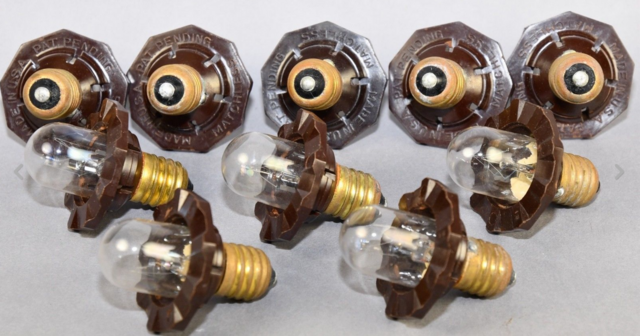 These 960 renewable lamp bases were used on the large 3-1/8" diameter 110-120 volt 15 watt Wonder Stars Christmas ornaments made by the Matchless Company in Chicago during the 1930s. I specifically want the C-9 intermediate base application. I don't need the valuable crystal attached to the Wonder Star. Premium prices paid for quantity and condition. Send picures of what you have. I can relamp your 900 series Matchless star base ring with a similar 110-120 volt, 15 watt, clear incandescent bulb to give life to your vintage lamp. You can't enjoy it if its not lit! Relamping service is exclusively for the standard medium E26/C15 and intermediate E17/C9 applications. You keep your crystal, I relamp just the base. The relamping makes your Matchless Star glow again! Quick turn around for the holidays!